yama-inu, yamainu　山犬、豺 "mountain dog"
. yamazumisama 山住様 /ヤマズミサマ "Deity living in the mountains" . 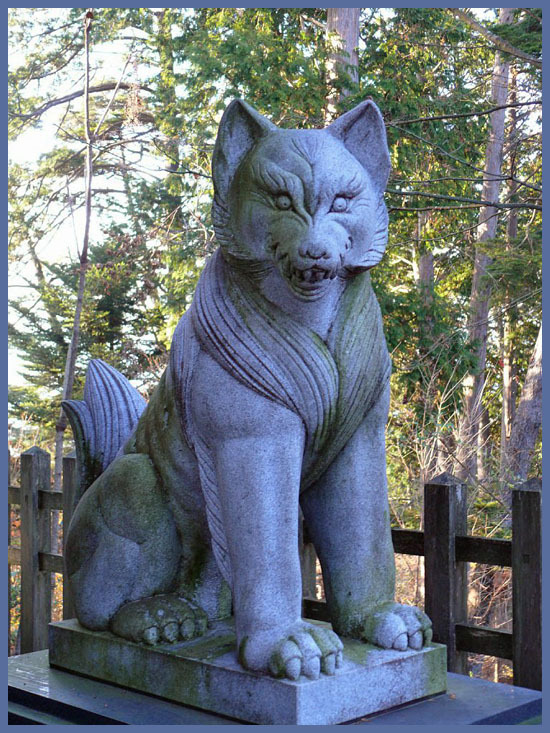 Oinusama 御犬様 O-Inusama, "Honorable Wolf Deity".
. ookami 狼 Okami, wolf .
. Matsuo Basho 鹿島紀行 - A Visit to the Kashima Shrine . As a messenger of the Mountain Deity, the wolves protect the fields by chasing deer and wild boars, which often harm the fields. 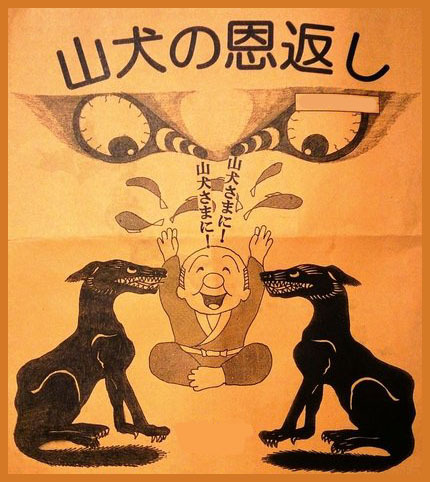 They also protect travelers, by walking behind them in a good distance - 送り狼 okuri-ookami. If the traveler comes to a human settlement after walking in the woods, he would place one of his straw sandals on the ground with an offering of rice. Other lonely travelers might be attacked by a pack of wolves and spent a night hanging high in the branches of a tree.
. Inugami 犬神　The Wolf Deity .
. inoshishi 猪 wild boar and wolf legends .
. sanbi 産火 / 産忌 - - shinibi 死火 / 死忌 fire taboos for birth and death . 源頼朝 Minamoto no Yoritomo wanted to defeat a family called Sumitora 墨虎 "Black Tiger". He brought a Mountain Deity 山神 and an Inari Deity 稲荷神 all the way from Kyoto and prayed for seven days and nights, with out food or sleep. On the 15th day of the 10th lunar month, a white wolf and a white fox appeared and their footprints lead to a small sanctuary for Sanno 山王祠 high up in the forest. He thought that was a hint from the Deities, started the battle and won it.
. Minamoto no Yoritomo 源頼朝 （1147 - 1199).
. Yamanokmai legends from Fukushima .
. yamainu no ongaeshi 山犬の恩返し the gratitude of a wolf ("mountain dog") . 丸森町 Marumori Karoosan 鹿狼山 Mount Karo-San "Dear Wolf"
. Tenaga Ashinaga 手長足長 "long arms, long legs" . On the border to Fukushima in Soma 相馬郡 there is mount 手長山 Tenagayama, where the deity 手長明神 Tenaga Myojin (The kami with long arms) roams.
. Yamanokami 山の神 and Yamainu legends .
. O-Inusama and the 太子堂 Taishido Hall .
. yamainu 山犬 Mountain Dog, Wolf .
. 静岡市 Shizuoka city 葵区 Aoi ward - wolf legend .
. Mitsumine Jinja 三峰神社 and the Wolf Cult . Yamato Takeru on his way to Eastern Japan 日本武尊東征 passed the road near 御嶽山 Mitakesan. A local mountain demon shape-shifted into a 白鹿 white deer and obstructed the road, so Takeru got lost. Now a white wolf appeared and showed him the way to the North-West. So Takeru prayed at the mountain top for protection from all kinds of misfortune 火災盗難 and proclaimed the wolf a deity 守護神.
. Yamato Takeru 日本武尊 legendary prince .
. sanki, yamaoni 山鬼の鬼伝説 mountain demons .
. 三朝町 Misasa hot spring .
. okuri ookami 送り狼 escorting wolf .
. inu 犬と伝説 Legends about the dog / Hund . okuri ookami 送り狼 "a wolf following someone"